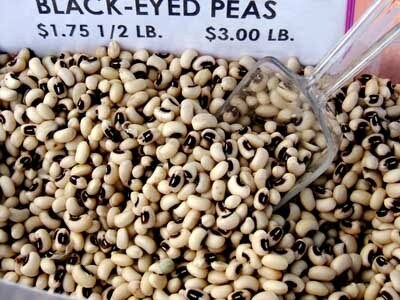 Bring dried black-eyed peas and water to cover to a boil in a Dutch oven; remove from heat, and let stand 1 hour. Drain. Remove skin from ham hocks. Chop meat from ham hocks, reserving bones. Sauté meat in hot bacon drippings in a large skillet over medium-high heat 3 minutes or until slightly browned. Combine peas, meat, bones, 4 cups water, and next 8 ingredients in Dutch oven. Bring to a boil; reduce heat and simmer, gently stirring occasionally, 1 to 1 1/2 hours or until peas are tender. Remove and discard bones. Serve over rice. Remove meat from turkey wing; chop and reserve 1/2 cup. Reserve remaining turkey meat for another use. Separate wing bone at the joint; reserve drumstick portion of wing. Discard remaining bones. Heat olive oil in a Dutch oven over medium-high heat. Add Anaheim chile; sauté 30 seconds. Add onion; sauté 2 minutes. Add garlic; sauté 30 seconds. Add reserved drumstick bone, collard greens, salt, red pepper, and black pepper to pot; cover with water to 1 inch above greens. Bring to a boil over medium-high heat; reduce heat, and simmer, uncovered, for 2 hours. Drain collard greens in a colander over a bowl, reserving cooking liquid. Discard turkey drumstick bone. Return cooking liquid to pan, and cook over high heat until reduced to 3/4 cup (about 40 minutes). Add greens and reserved 1/2 cup chopped turkey meat to pan; reduce heat, and cook 3 minutes or until thoroughly heated, stirring frequently. Stir in 2 teaspoons lemon juice. Serve warm.